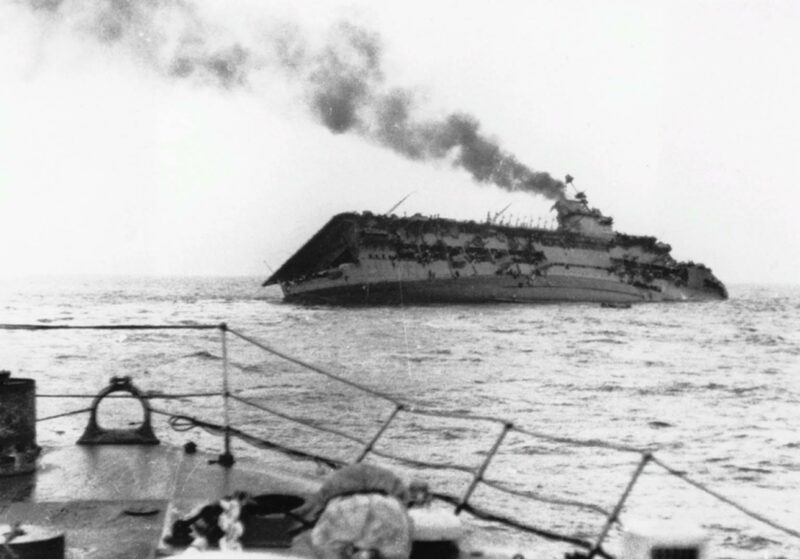 Battle of the Atlantic: The British “Courageous” aircraft carrier (HMS Courageous) is sinking after being hit by torpedoes from a German U-29 submarine under the command of Lieutenant Commander Otto Schuhart. On September 17, 1939, at 19 hours 50 minutes near the south-west coast of Ireland, the U-29 submarine fired 3 torpedoes to the “Courageous” aircraft carrier from a distance of 2,700 meters, two of which hit the ship’s engine room. Torpedo hits caused strong explosions and destruction. The commander of the aircraft carrier captain-commander W. Mekein-Jones ordered to leave the ship, and after 15 minutes the Courageous sank. Killed 518 British sailors (from a crew of 1,259 people) including the captain. “Courageous” aircraft carrier became the first ship of the Royal Navy, who died in the Second World War.